Being Jay Leno has its privileges. Talk show host by night and car enthusiast by day, he’s widely recognized in the automotive community as a car collector demigod, with his cache found under the roof of the Big Dog Garage. Being Jay Leno also means some very early access to vehicles — even before the media at large. For instance, Leno was lucky enough to already have a seat in the 2014 Corvette Stingray. 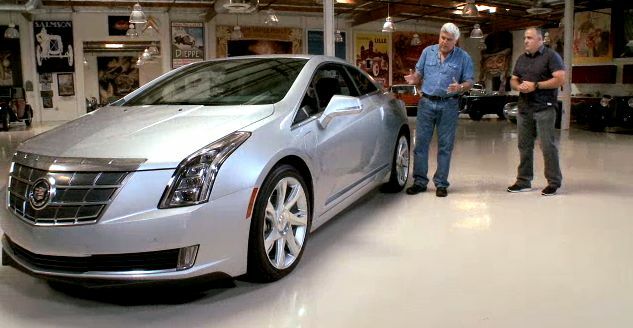 And most recently, Cadillac brought along the an early example of the 2014 ELR plug-in vehicle to his garage. This is significant because the ELR doesn’t launch until this fall. Even then it will be in limited quantities. The video below gives us his first driving impressions, along with little facts about the vehicle. agree – what’s the deal with the name? why ELR? don’t they know that the name is the most effective branding tool of all? SRX means nothing. Some think CTS stands/stood for Catera Touring Sedan, but it actually doesn’t, not now at least, in development in 2001/02 maybe, but no one wants it associated with the Catera. Same with STS. The old XLR was on the Y-body, what’s the X L or R mean in that? Nothing. It’s a naming scheme, doesn’t need to be an acronym. Personally I think it should have been thought out better after the CTS and SRX were a success in the market. Especially now with the ATS, what happens if they make a 1Series fighter, what does it get named? There is no defined trend in naming progression for the brand. At least it isn’t as bad as Acura for that, or Infiniti just calling every ‘Q**’ now. CTS, ATS, SRX, ELR….to me, they ARE names. I’m just glad that those names are attached to the best cars ever made by GM. History will tell us whether or not the present names in Cadillac’s range will be fondly remembered, and as of late, they are earning every inch of respect they carve out for the brand with each passing day. Very true Grawdaddy, The competition uses “names” just like Cadillac. They are letter designations sure but are also names in the same manner. Ha, Electric Luxury Ride maybe. On a more serious note it is a beautiful vehicle isn’t it. I also hope it does well for them considering the niche and pricing issues it may well have. This is such a beautiful car! Making an electric car sporty and handsome is rare. The ELR is up there with the Tesla Model S, well, almost…..The electric range pales in comparison plus it’s FWD based. But in the end, ELR does relieve you of that range anxiety Jay mentioned about all electric cars. But they seriously need to stop this silly coded naming scheme. Names like Fleetwood, DeVille, SeVille, Eldorado and even Cimarron had meaning. GM can’t stop the naming scheme. As these names are used, they gain more and more clout and image in the public. If GM stopped naming the CTS the CTS and called it the Catera, all of the hard work they put into A&S since 2002 would be lost for the sake of name. Many won’t like the names, but there really isn’t a better option when the CTS is punching above its weight; higher than what the Catera could ever do. These names echo how other luxury automakers usually name and organize their cars. As of late, it works for Cadillac, and allows the brand to move from strength to strength; from the CTS to the SRX to the ATS to the ELR. Apart from the Escalade which would have been the ESC, the names are probably going to stay. Yeah, numbers and or letters never work. It never worked for Jaguar with the XKR, Datsun with the 240Z, Chevrolet with the Z28, Chrysler with the 300, BMW with the 320i, etc.